As the metropolis provokes and inspires, it is the exposure to difference, otherness and frustration that stimulates the artist (Sennett 1990). And as the personal and collective narration is aiming at using urban symbolism for reforming urban mindscapes giving new dimensions to urban space, this is exactly the way the sign is linked to the social and spatial dimensions of places. What matters in this case is how people use these places for creating their collective urban plots. Their different mindscapes and imaginaries are the indicators for understanding the physical reality of the urban together with its consequent meaning. And this is where street art becomes the tool for making the invisible visible again and a community re-imaged and re-imagined (Irvine 2011). Except for offering uses and functions, space also includes potential and choice. The urban mindscape as another landscape, the one of the mind, consists of local and external images of the city which indicate something between the city as a physical entity and the visual perceptions people acquire about it (Bianchini 2006). Urban imaginaries can be defined as symbolic, psychic indicators of unconscious desires and social constructions impacting on urban reality (Silva 2003). As Castoriadis underlines, social imaginary is expressed by the people’s potential for creative and autonomous self- activity (Curtis 1997). In addition to this, l’imaginaire urbaine has been essential for constructing an experimental utopia for new urbanism (Lefebvre 1996) and besides this we can also state that the exploration of what is humanly possible needs to use the urban environment as a potential for encountering possibility and diversity that will give way to recreation. Therefore, city- dwellers need to participate in the process of attaching meaning to urban space by introducing their activities inside its context and therefore identify themselves through them. 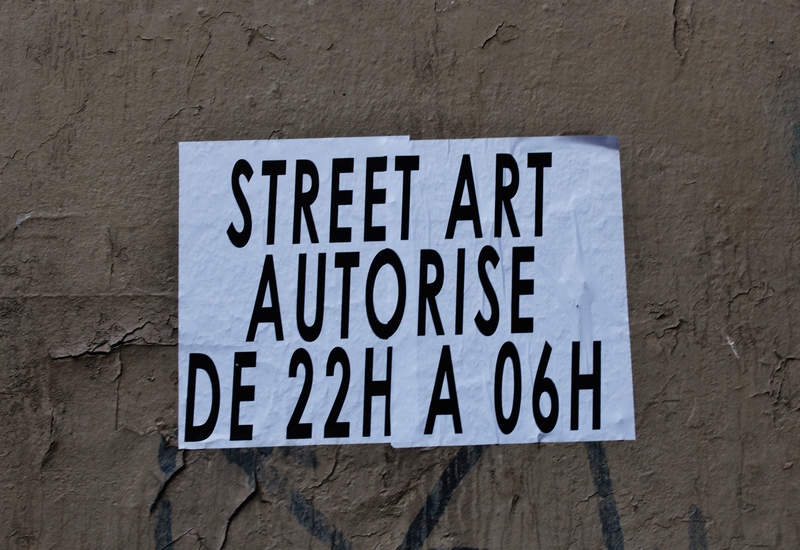 In most of the cases, thresholds, like street art communities, can provide with this opportunity as they give people the freedom that is considered as necessary prerequisite for play (Stavrides 2007). And there, the urban art movement, expressed via street art genres, becomes the paradigm of hybridity in global visual culture. Thus, street art production as a metaphor of the socio- spatial orientation becomes the community practice and purposeful tool for reclaiming space by spreading cultural signs. As the city is not merely a physical mechanism and an artificial construction, it is involved in the vital processes of the people who compose it, it is a product of nature, and particularly of human nature (Ambrose 1994). As a consequence, the role of the metropolis in the production of street artworks is of paramount importance if we take into consideration that the urban space is not only the inspiration and stimulation of the artists but also the environment they comment upon together with the place that hosts and sustains street art. In this distribution of the perceptible (Rancière 2004), street artists, as other drifters and flaneurs, another type of strollers, are looking for evidence in the urban space and by collecting them, they tend to construct their stories as another visual journey taking place in our daily paths. The artist Slinkachu for example, has created his world of Little People by setting up a variety of everyday life scenes of his tiny figures after having remodelled, painted and then placed them in city streets all over the world. In Slinkatchu’s work the world is transformed into this two-tier universe with reality contrasted against small frozen moments of an alternative world. Slinkachu decided to make something that would make people look down and stare with childlike fascination. The drama in the set-ups of the tiny characters reflects a wider urban experience and the annoyances of city life. The humour in the work prevents it from becoming too negative. It catches people where they least expect it and jolts them out of their everyday lives. His art might be small but his resonance is larger than life (Self 2008). Another example is the artist Space Invader who by spreading out ‘’mosaic viruses’’ all over the city is starting up an urban game whilst blighting up the place a bit. The city becomes the concrete, the substance to work on and a variety of adventures with different participants is constructed in this context. These little interruptions on one’s visual field are cheerfully subversive and utterly unchallenging , presenting themselves as somewhere between a jeu d’esprit and a mirror irritation, depending on one’s point of view. Will your street be invaded next? (mine was), a type of game to capture them and search to find them. (Invader 2008). The artist Mark Jenkins sculptures human- like figures by using box sealing tape and then positions them in strategic points inside the city. His practice of street art is to use the street as a stage where passers- by become actors. He usually appropriates indoor concepts by setting the same scenes outdoor in the streets; for example a man sleeping on a bed in the middle of a parking in Winston- Salem. Different genres of street art can be then seen as a variety of symbolic signs and images that construct their own situations by using public space in order to communicate a meaning that most of the times comes in opposition to the dominant one. The power of the message is also backed by the specific spot it is placed since the narration has to be constructed by using what is already there and at the same time transforming it into something new by giving it a different meaning. A good example is the strategically placed stencil in the forefront of Barclay bank with a sinister man in black hat reminding people who are using the cash point the danger of contemporary city life by shouting ‘’Beware pickpockets’’. The inscribed ‘’Vote here’’ on a trash can in New York can be seen as another case of questioning today’s narration and symbolism while detourning the already existing meanings. Therefore the placement of work is often a call to place, marking locations with awareness, over against the proliferating urban non- places of anonymous transit and commerce- big box stores, the mail, the Starbucks (Augé 2009). Street art is then the medium for constructing a new visual landscape, representative of a new kind of attention to the phenomenology of the city by introducing play and gift in public exchange. Ambrose, P. (1994) Urban Process and Power. London, Routledge. Augé M. (2009) Non- Places: Introduction to an Anthropology of Supermodernity, 2nd ed, London, Verso. Bianchini, F. (2006) European Urban Mindscapes: Concepts, Cultural representations and Policy applications. In European Studies: A Journal of European Culture, History and Politics Vol 23 No 1,pp 13-31. Curtis, D. (1997) In Castoriadis, C. ed. The Castoriadis Reader. Blackwell, Oxford and Malde, pp 8-15. Invader (2008) Invasion in the UK: Space Invaders and Its UK Influences. Trans- Atlantic Publications. Irvine, M. (2011) The Work on the Street: Street Art and Visual Culture. In Sandwell, B. & Heywood, I. eds. Handbook of Visual Culture. London, Palgrave Macmillan. Lefebvre, H. (1996) Writings on Cities. Oxford, Blackwell. Rancière, J. (2004) The Politics of Aesthetics : The Distribution of the Sensible. London & New York, Continuum. Self, W. (2008) Little People in the City: The Street Art of Slinkatchu, 2nd ed, England, Boxtree. Sennett, R. (1990) The Conscience of the Eye: The Design and Social Life of Cities. London and Boston, Faber and Faber. Silva, A. (2003) Urban Imaginaries from Latin America Documenta 11. Stuttgart, Hatje Cantz. Stavrides, S. Heterotopias and the Experience of Porous Urban Space. In Franck, K. A. & Stevens, Q. eds. Loose Space: Possibility and Diversity in Urban Life. 2nd ed, London, Routledge.